This story ran on the Patch site this morning. As always, if you have comments or recipes to share, please go to the Patch site. Thank you! Some days the only thing you really want is chicken soup - or maybe carrot. In my grandparents' two-family house in Brooklyn, dinner always started with a hot cup of soup. My grandfather would take the subway home from his office on Wall Street, and my grandmother, rested and energized from a day of playing duplicate bridge, would place a cup of hot soup before him. They had the division of labor all figured out: Grandma would cook and sew, and Grandpa would fix things and clean up. When winter starts blowing cold air on your mood, some days the only thing you want is soup. That happened to me last weekend. After a Saturday jammed with wrestling practice, baseball, tennis, and a basketball game (granted, these were my kids’ activities, not mine, but I was exhausted from all the driving and watching), I woke up Sunday morning feeling, as the French would say, like merd. Sedated by a cupful of Nyquil the night before, I was sleeping peacefully when my husband went to the gym. He figured I’d get up eventually and drive our younger son to religious school and he would pick him up. But I was basically unconscious. When I fell out of bed at 10 a.m., it was only because our dog was throwing herself at the bedroom door, scratching and crying, no doubt thinking I was dead. I went downstairs. The house was delightfully quiet. Was it possible my husband had dropped my younger son off at religious school, taken my older son to the gym, and let me sleep in peace? How fabulous! Uh, no. Both kids were actually in the house - one fast asleep, the other sitting quietly in the basement, zoning out in front of the TV, waiting to be carted off to Sunday school. But the habits and misunderstandings of men, women and children and the complications that ensue when they share the same space is not what this story is about. This story is about soup and the yearning for it. The soup I craved was chicken soup, but the only soup we had in the pantry was canned tomato. When you're sick, canned tomato soup is not going to solve your problems. Then I looked in the freezer. There was a frozen chicken carcass, circa mid November, and a package of boneless chicken breasts. I could throw some soup together and it wouldn't take long. I downed a cup of coffee, got out two pots, and went to work. The beauty of a frozen chicken carcass is that it can last a good, long time. This carcass was from a recipe for jalapeño chicken that came from Lisa Fain’s The Homesick Texan Cookbook. We ate it two or three days in a row and then got sick of it. But it was so good, I couldn’t bear to throw out the carcass or the meat so I put it all into ziplock bags and hid them in the back of the freezer so the carcass wouldn’t scare anyone. Into a big pot it all went. I covered it with a quart of chicken stock, turned on the stove, let it boil, then simmer. and added two handfuls of kale. That was soup number one. Then I took the boneless chicken breasts and tried to think about what to do with them. I had taken a soup class with Pam Riesenberg a few weeks earlier. We had made several soups, one of which was a lovely chicken barley soup with spinach. The problem was I was trying to avoid gluten so didn’t want to use the barley. And we didn’t have any spinach, nor did I have the energy to go to the supermarket. I used Pam’s recipe as inspiration, and made do with what I had: Four skinless, boneless chicken breasts, frozen peas, carrots, a package of bean threads (look just like noodles unless you know better), and chicken stock. Pam’s recipe called for two breasts but I used four, so that the soup could serve as a real dinner for my older son, who was trying to make weight for wrestling and needed a lot of low-fat protein. My husband and my older son loved the chicken chunk soup. I ate cup after cup of it until I felt better. My younger son said he didn't like soup but changed his mind once I poured it onto his plate and called it chicken stew. (It was that chunky.) The same day I made these soups, my neighbor called and said she was making carrot soup with dill, from the New Basics Cookbook. “Do you know it?” she asked. Of course, I knew it. 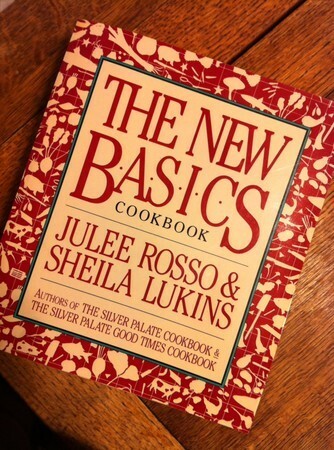 Every person who lived on the West Side in the '80s and '90s knew of the New Basics Cookbook and its slimmer, older sister, The Silver Palate Good Times Cookbook. “It’s page 93.” Oh. Carrot soup did sound good and easy but I was tuckered out from boiling the chicken. A few days later, though, we went to walk our dogs. “Do you have any dill leftover?” I asked. My neighbor did. She handed over her leftovers, plus a couple of celery stalks. That carrot soup was divine and after the first ten minutes of prep, took next to no time to prepare. The recipe calls for creme fraiche at the end. I didn't add it, because we were all supposedly watching our weight, but you should. Stay warm and to paraphrase the patron saint of iToys, stay hungry. In soup pot, heat oil over medium heat and add carrots, celery and onion. Cook until tender, about 8 minutes. Add chicken, stir and cook another 2-4 minutes. Add chicken broth and thyme and bring to boil. Stir in bean threads, cover and reduce heat to simmer, about 10 minutes, until bean threads and chicken are cooked through. Add in peas and cook a couple of minutes. Season with salt and pepper and serve. Melt butter in soup kettle. Add onion and cook over low heat until wilted, ten minutes. Add carrots, celery, stock, 1/4 cup dill, salt, pepper and cayenne. Bring to boil, reduce heat and cover. Simmer until carrots are tender, about 40 minutes. Allow to cool slightly. Puree the soup, in batches, in a blender or food processor. Return to kettle, stir in remaining two tablespoons of dill, and adjust through. Heat through. Serve each bowl of soup with a dollop of creme fraiche, a sprinkling of red pepper and a spring of dill.